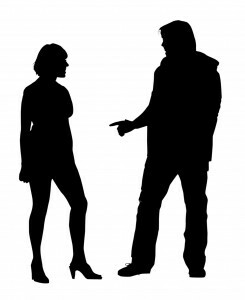 How can a pattern of negative interaction develop in a romantic relationship? How can a couple end up finding themselves stuck in psychological tension? And how, if at all, could meditation make a difference? What are the potentials and limitations? Mira was driven by a strong and growing urge for affirmation of her emotions from her partner, Fred. She wanted him to say that he understood her and accepted her reactions. Whenever he didn’t meet her need for affirmation, Mira felt rejected. At the beginning of their relationship, Fred found her vivacity and spontaneity refreshing. He was fascinated and stimulated by her colourful emotional self-expression – which he didn’t have himself. As her reactions grew stronger, it became more a matter of tolerating them, and he had to tell himself he’d better get used to it. Gradually, something happened between them: more and more often, Mira felt rejected, and the intensity of her emotions grew. Fred, for his part, understood that he was approaching the limit of what he could handle. He often felt pushed to respond to Mira in a way that wasn’t natural to him, and felt less genuine within their relationship. When Mira was driven by her emotions, Fred’s spontaneous response was to become vague and non-committal in order to cover up his true feelings. His evasiveness helped him keep a sense of control and necessary distance. When she demanded affirmation, he would withdraw and clam up as much as he could, to avoid the intrusion of her strong feelings, which to him were beginning to seem irrational. Mira felt she was in a process of personal growth towards more self-assertiveness, and claimed that openness about emotions was important. She not only wanted a continued growth process for herself; she also wanted Fred to join her in this process. Her efforts were, however, doomed to failure. As Fred increasingly felt dominated by her, his sense of security and control over himself and his feelings was rattled. What happened next? Fred was at a loss about what he could say without creating new problems. When the tension between them increased, he couldn’t find the right words and felt unable to give Mira what she wanted. A vicious circle ensued. As his vagueness kept triggering a stronger need in her for affirmation, his feelings of control were even more threatened. This increased his defensive response in order to avoid showing her his true feelings. His dominant defence mechanism was to become evasive, when she needed him to be clear. The more she pushed him, the more defensive he became. This happened increasingly often, to the frustration of both. Positive dialogue disappeared. He felt incapable of doing things the right way in their relationship. Their future as a couple didn’t look promising. Both of them saw clearly that they were no longer moving in the same direction. Whenever she wanted him to be open he escaped, like a bar of slippery soap. She felt rejected, whereas his main focus was to avoid her emotional outbursts, which felt like an attack on him. Their different life histories and had encouraged different patterns of emotional reaction in each. Both of them had psychological hangovers from their varying experiences that remained unresolved in their minds and still needed to be worked through. How could they unwind the psychological knots between them? Could Fred and Mira have avoided the increase of tension between them if they had meditated? Or, if the tension had already built up, might learning to meditate be helpful in moderating it? The answer has to do with the release of tension that meditation brings. Experience suggests that the open, accepting attitude in meditation may, over time, help us see ourselves more clearly and understand our spontaneous reactions better, and this may be of help when psychological tensions build up. The effect depends, however, on the people involved. At times, tension in intimate relationships may be quite significant, and there is no guarantee that it won’t build up even if one meditates. The irrational influence of our strongest emotional issues may overshadow the rational mind. Such tensions could be termed our ‘blind spots’. Experience indicates that a free mental attitude is the best tool to help reduce tension, whereas a mental attitude lacking openness and acceptance won’t resolve anything. We cannot release tensions as long as narrow concentration is the dominant force, since that leaves us stuck in one perspective. When tensions build up, only a free mental attitude will facilitate their release. Would more openness and acceptance between Fred and Mira help them see themselves and their relationship in a new perspective? Our expectations should be realistic. In romantic relationships, psychological factors have a stronger impact than in, e.g., relationships at work, and tensions are harder to release. But the question is worth asking: supposing that Fred and Mira started to practise meditation in order to reduce the tensions of their relationship, how might it happen? Gradually and with much patience, they might become more aware of their spontaneous emotional reactions, making their blind spots less blind. The free mental attitude might help them move on where before they were stuck in psychological tension. If both of them were able to stop for a moment and take a look at what was happening from a new perspective, they might give themselves a fresh chance, instead of remaining in a vicious circle. How far could they go? That would depend on their tolerance for tension and emotional discomfort. When a negative perspective no longer dominates, there is space to talk about difficult issues in a more neutral setting. This might make a noticeable difference. Questions remain: would they have the necessary patience? Would the negative feelings take over again? Or would seeing more clearly, rather than presenting them with a new chance, instead bring them to the conclusion that so many couples reach these days: that after all it would be better to split up than to keep wrestling with a relationship that doesn’t really function? The answer is not a given, but whatever the result, meditation might contribute to a more realistic solution to their quandary. Interesting perspective and article! I personally experience that meditation makes a difference in relationships, both with my boyfriend and others.